A couple of weeks ago I got desperate and called our pediatrician for advice. His nurse promptly called me back and explained that at this age toddlers develop “bedtime resistance.” She suggested giving Coraline two milligrams of melatonin drops about a half hour before we wanted her to go to sleep. Since our bodies naturally produce melatonin, she said you could, in theory, take melatonin drops indefinitely (which we aren’t going to do). Desperate for a return to normal evenings and uninterrupted sleep, Rich and I went straight to a vitamin store after work to buy some. We were giddy at the thought that something might finally help Coraline go back to her old non-screaming, non-head-spinning-and-pea-soup-spewing sweet, sleepy self. I very well may have skipped into the vitamin store. That night we were only able to get one milligram of melatonin into Coraline, but it did the trick. It was Rich’s turn to put her to bed that night (OK, so I chickened out and traded nights with him. She was THAT bad at bedtime), and he said that she got drowsy right on schedule. 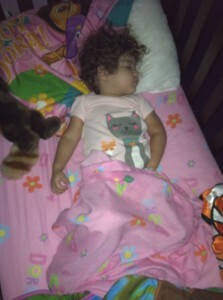 He put her to bed without incident, and we didn’t hear a peep from her until it was time to get up the next day. It was glorious. We’ve made giving her that milligram of melatonin part of her bedtime routine. It has an orange flavor, and since she loves taking medicine, it’s not a problem to get her to take it. We’ll probably stop giving it to her after a month, like her nurse suggested, and see if she’s been “retrained” to sleep by then. If she hasn’t, back on the sauce she shall go. I’ve missed reading you (but life has been insane and I haven’t been reading my fave bloggers). Anyway, Coralie is the cutest! I can’t get over her curls and she looks like the perfect toddler (despite tantrums and sleeplessness). I didn’t know about melatonin, I think i’m going to try it on me, this week.